Hope everyone had a Happy Fourth! As for the FAQ, the BF and I escaped the beach (where it seemed that everyone in LA decided to come) avoided the crowds and went the opposite way to the home of some friends to have a quiet bbq on their deck in a wooded area. Ah. It was warm and lovely. Just to see and hear animals in this town is such a treat! Hummingbirds were only feet away from us as we enjoyed our feast. My BF made some homemade sparklers, we laughed a lot and agreed that there's nothing better than sharing good food with good friends. So what was on the menu? I brought some Texas caviar, which if you're not from the south (I'm not either but my sis is...I got this from her) is a dip made with beans, hominy, cilantro and lots of other goodies, served with corn chips. For the main meal, there was something for everyone! Swedish pork and potato sausages, chicken sausages, Southwest veggie burgers and the BEST hot dog find for me....Buffalo and Pork hot dogs from Broadleaf. Yes, buffalo. As in Home On the Range time. I've had buffalo before and enjoyed it, but these were something else. Dense, tender, juicy and DEE-LISH (no preservatives, no fillers, no dairy, no soy). They were a big hit, even by people who shall not be named who were scared of them. They come frozen, I bought them at Surfas (www.surfasonline.com) but despite being frozen they tasted super fresh and grilled up beautifully. To accompany them we had lots of condiments (relish, two mustards, two hot sauces, ketchup) to choose from, I went for hot sauce and mustard since I forgot to bring my own soy-free mayo. And went bunless and cheeseless, of course. As a side dish, I also brought Indian-style fruit salad from Neela Batra's book "The Indian Vegetarian". I had the pleasure of taking one of her classes at the New School of Cooking a few years back and got over my fear of learning to cook exotic. This dish is simple and delicious -- sweet and a little spicy, and a nice change from regular potato salad or plain old fruit salad. It goes great with grilled meats, esp. when chilled. The one unusual but critical spice is Chaat Masala, available in any Indian store. It's inexpensive and makes this special. Try it! Arrange all the fruits artistically on a platter. Top with lime juice, chaat masala and pepper, add more to taste. You can also toss it gently, if you like, but it won't be as pretty. It can be prepared 3-4 hours ahead and chilled. Hope you celebrated your independence with your loved ones! great blog. we have multiple food allergies as well. all of us-hubby, son and myself and well we dont know about my 7 month old yet. I am looking for a nitrate free beef hot dog without garlic. do you know any? great blog! BEEF, WATER, CORN SYRUP, CONTAINS 2% OR LESS OF: SALT, POTASSIUM LACTATE, PARTIALLY HYDROLYZED BEEF STOCK, SODIUM PHOSPHATES, FLAVORINGS, SODIUM DIACETATE, ASCORBIC ACID (VITAMIN C), SODIUM NITRITE, EXTRACTIVES OF PAPRIKA. Applegate Farms makes an organic beef dog with no garlic either, but I remember it being kinda tasteless. 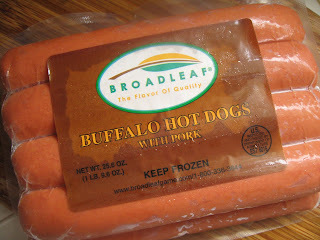 Broadleaf (same as the buffalo dog) has one but I couldn't get the ingredients online.